Quick breakfast options like cereal or toast are pure carbs. 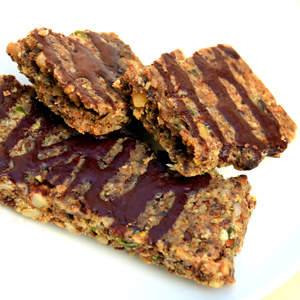 So how about making some low-carb granola bars? Great for a quick breakfast on the go. Or perhaps a mid-morning snack with your coffee. Adapting traditional recipe to be low-carb is easy. All we need to do is use nuts and seeds instead of grains. And substitute sugar for a sweetener. We will add a spoonful of nut butter, and a couple of eggs to hold the bars together. The recipe will take about 30 minutes in total. Make them in advance, and they will keep for a week or two. You don’t even have to put them in the fridge. And the best thing is, they only clock up 3g net carbs per bar. You can use any combination of nuts and seeds. Avoid peanuts and cashews, as they are higher in carbs than other nuts. Almonds, hazelnuts, brazil nuts, macadamia, pine nuts, walnuts are all great choices. The only type of seed I included separately is [flax-linseed-US]. Flax is very high in fibre. Fibre binds water and helps to hold the bars together. Otherwise they might be a bit crumbly. If you don’t have flax, substitute with 1 tbsp psyllium husks instead, or a small amount of emulsifier such as [xanthan-US] or [guar-US]. Traditional granola bars often include dried fruit. Unfortunately, that’s a sugar bomb. So we need to avoid them. Adding a bit of sweetener makes the bars taste sweet enough without the fruit. Blitz all the nuts and seeds in a blender, or using a hand-held beater. Don’t completely pulverise them – overall texture will be more crunchy if you keep some biggish bits as well as very small ones. Add all other ingredients and mix together thoroughly. You should end up with a dense sticky mixture. Hi, can I make the chocolate drizzle using ground cacao nibs and coconut oil, in the same amounts? Hi Helen, I think ground cacao nibs should work but not sure about the amounts – they taste more intense than regular cacao powder, don’t they? I rarely use nibs so I am afraid I don’t know – you may have to do a bit of experimenting. Good luck! I will do that, thanks for the reply! Does the nutritional information include the chocolate drizzle? Hi Laura – yes it does – if it’s made as described in the recipe, using pure sugar-free 100% cocoa baking chocolate or powder. I made these last night and my husband won’t eat them. I’m a pretty healthy water but they are too bland even with the drizzle. Any suggestions to save them? Pretty expensive to through out to the birds. I tried spreading with more peanut butter and sliced banana and that helped but they can’t be stored like that. Thanks! Thanks for the recipe. I’m excited to try it. I was wondering if tahini could be used. Hi Eugenia! Yes, tahini should be absolutely fine. I hope the recipe turns out well for you! Hi, could I just use normal butter in place of the nut butter? Some really great recipes, thank you! Hi Linda, thank you! I am not so sure about normal butter, as it melts so quickly. Nut butters are denser and more sticky, and help to hold the bars together. You could try it but I am not 100% sure if it will work. Sorry! I really enjoyed making and eating these. I know from previous experience I don’t like drizzle so I left them plain. They keep my energy going for the morning until lunch so they are an excellent breakfast option, especially when I’m short on time. Thanks for letting us know Helen! I am so glad you enjoyed the recipe. Thanks for your feedback Catherine, I am so glad you enjoyed it!